These days, few cafes impressed us enough for us to return again and again. But Hoopla Coffee & Kitchen made it and we have been there on a few occasions and none of the experiences disappointed. It is located at the nondescript one-north, in a building called Infinite Studios. Not the most accessible cafe in the West of Singapore, but definitely worth making a trip down if you haven’t. With a welcoming and hippy environment where you can hang around with your friends, the brightly-lit cafe has a menu with nothing above S$17. On the drinks menu, Hoopla is known for their matcha drinks. There are several to choose from – like Matcha Milk at S$6 and Matcha Salted Caramel at S$7 – but to be honest, those didn’t leave too great an impression on us; we prefer their regular brews and hot chocolate anytime. Over on the food side, the kitchen has lots to offer – soups and salads, sandwiches, buttermilk waffles, breakfast dishes and comfort food, and signature steam pau sliders. Making a decision might be difficult, but we’ll help you. The Buttermilk Waffles (S$4) that’s served with your choice of sauce is awesome. Crispy and warm, they are baked fresh to order. If you need a scoop of ice-cream, the add-on is only S$3.50 and we absolutely love the Tahitian Vanilla Bean. The range of baked eggs (S$13 – S$15.50) under the ‘Comfort Food’ section are comforting indeed. But try it and you’ll know what we mean. We tried the Garlic Butter Prawn Aglio Olio (S$15), and it was decent but not fantastic. We’d say just go for the breakfast options. Hoopla ticks all the right boxes – a comprehensive and inexpensive menu, aromatic brews, airy and spacious, artsy and makes good photo spots, and parking is very cheap. 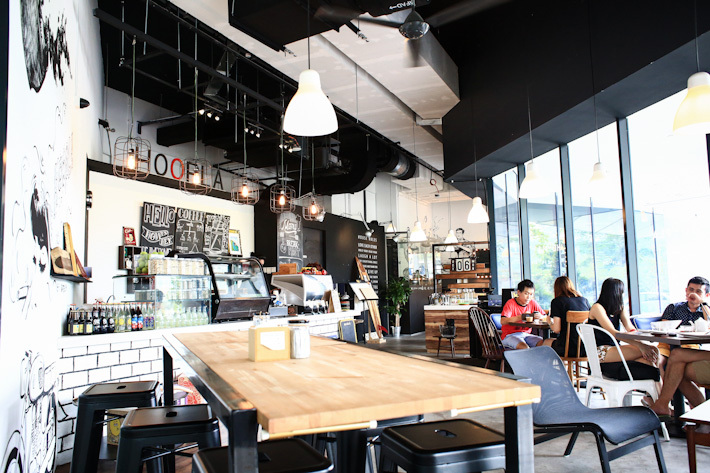 For more recommendations, read our guide on the top cafes in the West of Singapore. I’ve only been to Hoopla once, today actually. What a disaster. The crew seemed to be one family including the elderly parents. None of the family members had a clue how to run a cafe and have no business in the F&B industry. Furthermore the food, a pasta and sandwich was mediocre at best. If you like good coffee and equal service, go somewhere else. This place is terrible. I also went today and it was a poor excuse for a cafe. One meal never arrived, the other was tiny. Workers had no idea what they were doing. It was actually painfully awkward and we just wanted to leave as fast as possible. I was ta Hoopla today with my family for breakfast. We all ordered Eggs Salmon Benedict x4. Three meals arrived and had been eaten by the time the forth came. I went to the counter to ask about it and was told it was on the way. There was no apology, no concern – even when the meal finally arrived and the waiter cleared the other plates at the same time. The Benedict sauce was also very sweet – bottled? Not going back to Hoopla again. The place is closed currently.